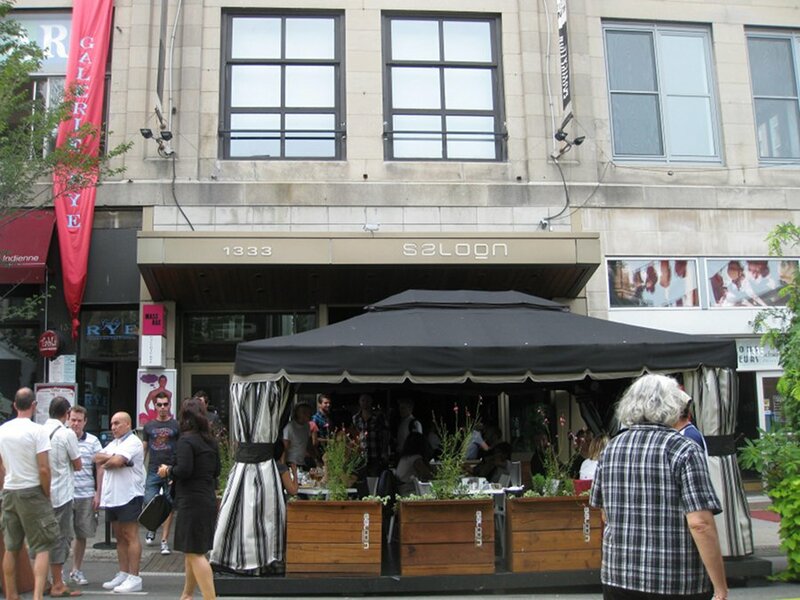 When you walk up to Saloon you notice a nice terrace outside that can seat around twenty or so people. The inside is quite impressive since this place is also a supper club at night so you can imagine how the décor can be rather impressive. There are chairs and tables on two floors as well as a few banquette seats. There is a large bar on the right hand side and washrooms near the end. 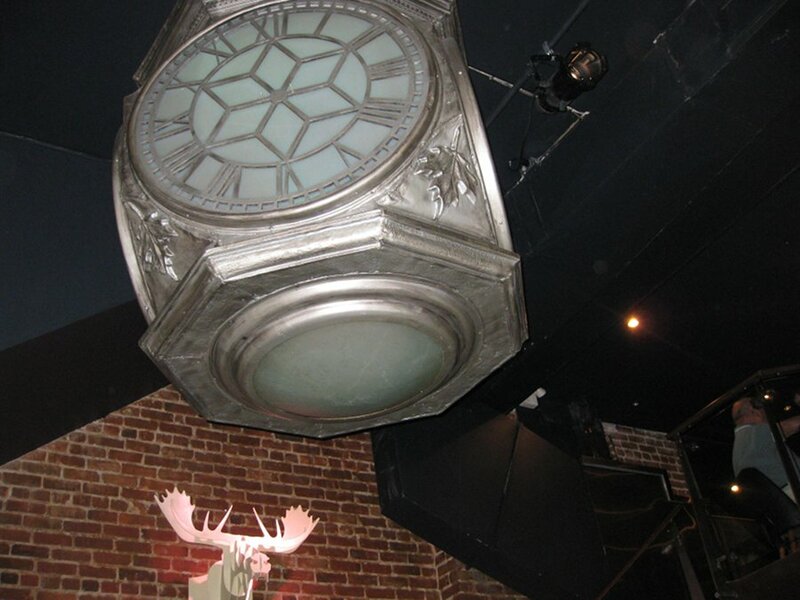 The style is definitely new and funky; they have a disco ball on the ceiling and this enormous clock right in the middle of the establishment. The bar is stocked with alcohol and a cool wall unit that fades in and out with a bright blue light. 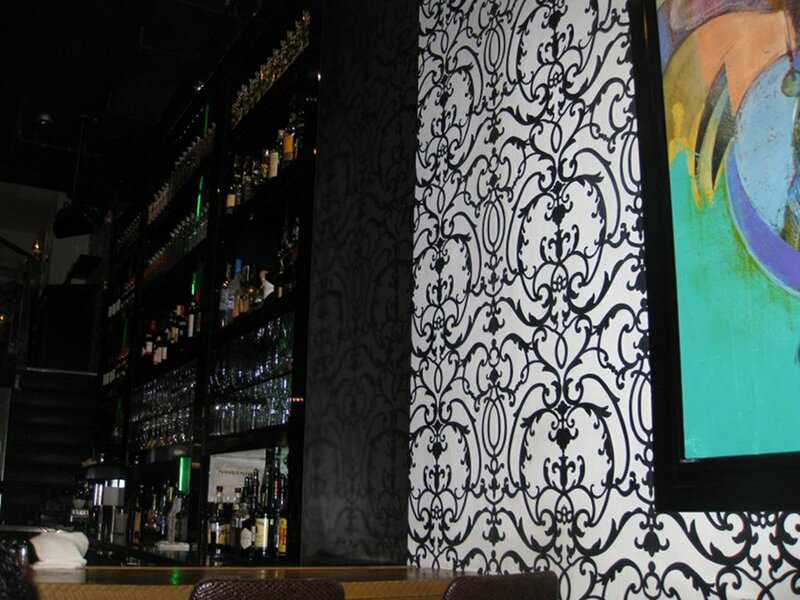 The wall paper is also quite attractive and makes for a stand out appearance. There is also music playing although it is not too loud so you can still hear yourself speak. A nice feature is that there is a wheelchair ramp onto the sidewalk and the washrooms are wheelchair accessible. You may consider making reservations since it can get pretty jammed early on, we got there at 12:30 and for a group of 4 we got the last spot in the place; although by 1:30 lots of extra space opened up. 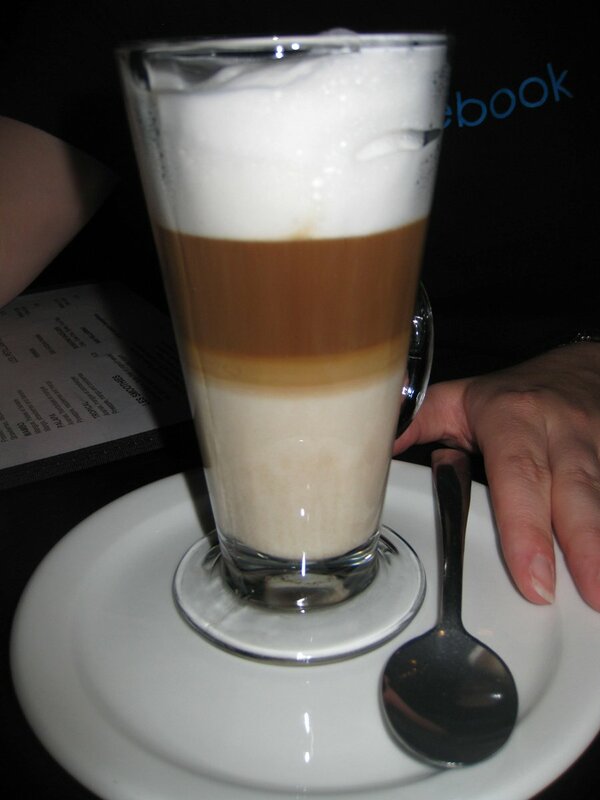 We started off with some coffee and drinks and the drip coffee was really tasty so I had multiple refills. If I don’t sleep tonight I’ll know what caused it. 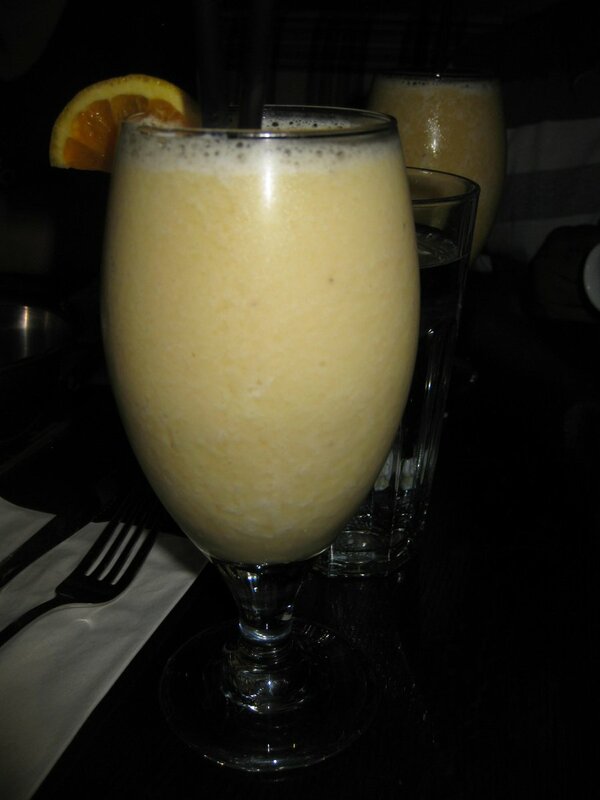 My friend ended up having the Mangano fruit drink ($4.95) and I had the banana mango smoothie ($5.95). Both drinks looked exactly the same but mine had a slight taste of vanilla. The drinks were tasty but I would have liked more mango taste. In fact mine tasted cold (nope that not a typo); it’s hard to describe but as soon as I started to drink it, I associated it with a cold sensation. We had four different dishes and choosing them was fun since there some very interesting options and we were feeling a little adventurous. 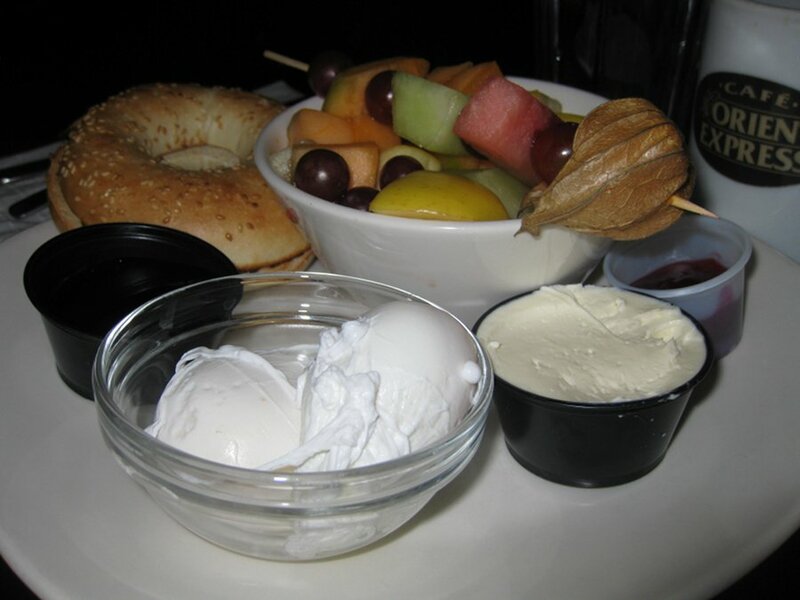 My friend ordered the Oasis ($7.95) which is a fruit plate with 2 poached eggs, bagel, cream cheese, honey and homemade jam. There was a fruit bowl with varied fruits and a brochette of fruit with even a cape gooseberry which is something I rarely see. The dish also came with this dessert like square that was described as wheat bran; this is a hard item to describe and I hope it comes out clearly in the pictures. It’s an off while triangle that is kind of spongy and very tasty; it is not overly sweet and is not too heavy. The closest thing I can compare it to is a south Indian breakfast item called Idli, although the taste is very different from what I have had, so I think they got creative in the kitchen. The price of this dish is decent for a healthy option and the fruit is fairly varied which is nice. I would have liked to see the fruit bowl offering a little more fruit, maybe an extra 25%, but that’s ok.
Next came the Eggs Roulés ($7.95) which is a plain omelette with bacon, mozzarella, lettuce and tomatoes, rolled in a tomato and basil tortilla with home fries, fresh fruit brochette, breakfast dessert and whole-wheat toast. This dish is very interesting and tasty; the tortilla idea is lots of fun and offers some extra fillingness to a normal omelette and the potatoes were also very tasty and quickly disappeared. The price makes this dish quite attractive considering it is rather filling and fun. For some reason the dish did not come with bread as advertised so I don’t know if it’s an oversight in the kitchen or the menu was changed and not updated in print. The dish which was by far the most impressive was the Crepe Chicken Mandarin ($9.95). 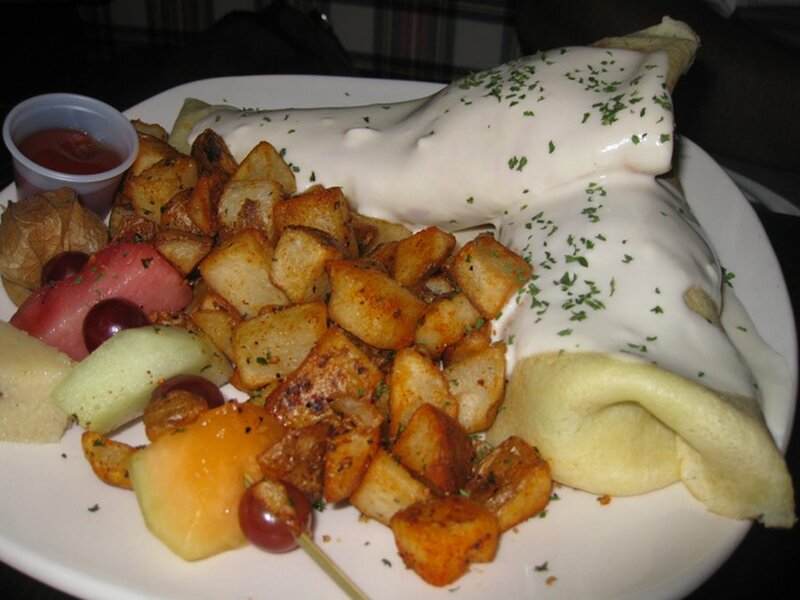 This dish is a two rolled crepes stuffed with chicken, mandarin oranges, goat cheese, spinach and béchamel sauce as well as a side of fruit brochette, potatoes and that special dessert. This dish was spectacular; one bite into it and you are transported to somewhere magical. Whoever came up with this is a genius. The taste delivers 110% and this was hands down the best dish on our table. The appearance of the dish is not too appetizing because of the béchamel sauce which I am not a fan of but that is not denying the great taste of it. Lastly came my dish and I went with my true love: eggs Benedict. As of recently, I feel I have been neglecting it by going more for French toasts and crepes but I came back and tried out the eggs Benedict Saloon ($10.95). I was tempted to try out the eggs Benedict Italian since it had cooked prosciutto in it but since I prefer my prosciutto cured I decided to try the eggs Benedict Saloon and I was glad I made this choice. The dish came with sautéed mushrooms, cream cheese, walnuts and green onions, fruit brochette and the breakfast dessert. 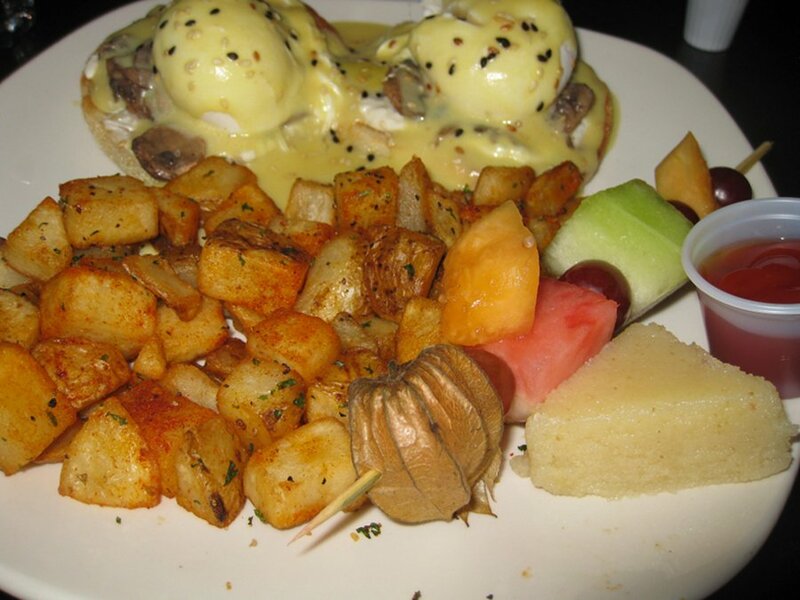 The hollandaise sauce had a nice light taste and was not overpowering while still maintaining a decent consistency. The sautéed mushrooms were a very nice touch and made for a novel dish. I did not notice the walnuts but I was happy with my dish so that’s all that matters. Our waiter was quite good as he was attentive, explained the menu and did not rush us at all. Our coffee refills were quite frequent as well as the water and he did a great job of making sure there were no empty sugar and milk containers on our table. I find lots of other places don’t go out of their way to clear them. 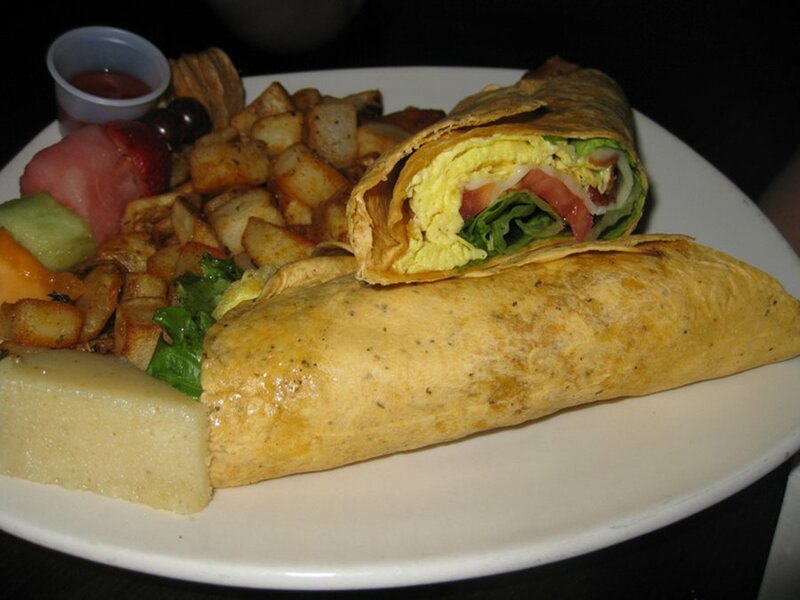 The menu is fairly meat focused, although, there are some options like the crepes which have a greater percentage of vegetarian options and there are also two salad options. While none of us ordered the salad dish, I saw one pass by and it looked very large and filling so if you are hungry you should be filled by it. Overall, I was quite impressed with Saloon. The décor was nice, the food was delicious and the prices were relatively fair even if you factor in paying for coffee. The menu is very creative and some dishes like the Chicken Mandarin Crepe really left a strong and tasty impression. I suggest you consider checking it out as it is well worth the trip and not too far from the downtown core or the plateau.